Our First Reading contains a line quoted by Our Lord during the cleansing of the Temple (Mark 11:17). At that incident, Jesus saw how the merchants and money-changers were not only using the sacred space of the Temple for their own worldly business transactions (thus profaning the holy Temple), they were also setting up shop in the court of the Gentiles, specifically under the awnings which shaded the people from the heat of the sun. In short, they were crowding out the God-fearing Gentiles from worshipping the one true God. Jesus became righteously indignant at this sight, because He knew that God wanted all people to be gathered together to worship Him, the one true God, and that provisions were made in the holy Temple for Gentiles to worship. Yet, these merchants and money-changers were allowed to crowd them out, thus sending the message that the Gentiles did not matter in the religious scheme of things. And so, by the cleansing of the Temple, Jesus was defending the rights of God-fearing Gentiles to call God their highest value by worshipping in the Temple area. Yet, in our Gospel, Jesus seemingly contradicts this in His behavior toward the Canaanite woman. Let us set the stage. Where is Jesus and the disciples? In the region of Tyre and Sidon, a land set outside the Holy Land, populated by a majority Gentiles. Yet, Jesus behaves toward her in three distinctly dismissive ways: First, He ignores her. 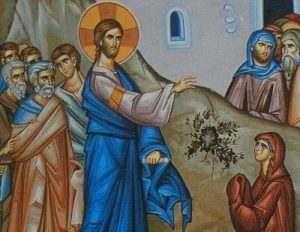 Next, when she continues to plead, and the disciples beg Him to send her away, Jesus merely responds that He was sent only to “the lost sheep of the House of Israel.” Lastly, after she presses further, He seemingly insults her by making reference to not feeding dogs with the food of the children – to which she responds eloquently. What gives? Is Jesus contradicting His cleansing of the Temple area? Or does He have a different motive in mind? Note that, 1) although His actions were what we would consider rude or dismissive, Jesus did not send this woman away out of hand. 2) Rather than thinking of Jesus as arrogant or rude, consider Him as a coach, leading the Canaanite woman to a greater faith, a greater conviction that Jesus saves. Just as in sports, when a good coach wants to get the most out of an athlete, he will push the athlete harder, almost seeming cruel, but all this is to make the athlete stronger in his craft. Here, Jesus is getting the woman to exercise her “faith muscles,” so that the strength of her faith would endure through trials. Just like the seed that is sown on good soil, Jesus wants our faith to endure, not to be choked up by the cares of the world, or by discouraging results or lack of support. Jesus challenges the Canaanite woman, as He challenges us: How serious are you about your conviction of Jesus power to save? Are you willing to persevere in faith, regardless of the setbacks?